Set of geometric shapes containing circles, triangles, squares, rectangles & pentagons. These shapes comes in three different colours namely: red, yellow & blue. They also come in big & small, thick & thin. The set is completed by two large boards & dice. With the help of the geometric shapes and boards (worksheets), the teacher can explain how each row has to comply with the specific shape & which line to a specific colour. The children can be left to solve the problem by themselves. 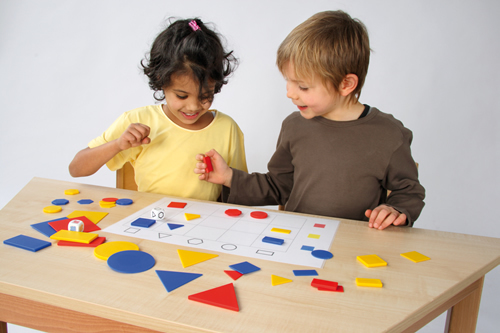 If this concept is not understood, the teacher can go back one step and take away the boards (worksheets) and allow the learner to sort according to colour and then according to shape. Once this concept is understood, the teacher can reintroduce the board (worksheet). For more ideas on activities for different age groups, download the free Teachers’ Guide below, available in English, Xhosa and Zulu.